The exceitement began with Christmas Day but continued into Boxing Day when I was a kid. That was the day that the holiday started. For many years when we were kids the holiday destination was the Ball Caravan Park on the Murray River at Corowa. For around 10 years I made that trek with Mum and Dad, my sisters and various other family and friends and we’d camp there for around four weeks every year. That means that I spent around a year of my life in that town. 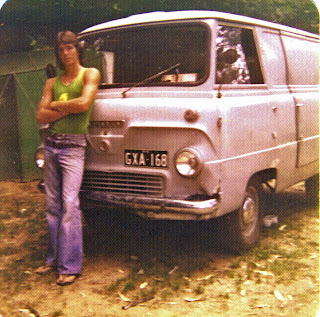 Dad would pack up his old Ford Thames van with all of the gear and he and I would take off early Boxing Day morning. Many times there’d be a deck chair set up inside the side door and my cousin Gavin or one of my mates, David Palmer for a couple of years, would sit in that chair in the back. It wasn’t illegal in those days, there were no requirments to wear seat belts and besides the van struggled to do 35 miles per hour meaning what is now a three hour trip took us around 7 or 8 in those days. We went with all the comforts of home, carpet for the floor, an ice chest, chairs, gas stove, umbrellas and a foam mattress for me to sleep on in the back of the van. It was a dry heat in Corowa, the plane trees shaded the camping ground and helped keep it relatively cool in the shade. It didn’t really matter because we spent most days at the pool which was adjacent to the camping ground, spending hours perfecting our bombing and horsie technique. For those who don’t know the terms that was a way of leaping into the water and causing the biggest possible splash without doing a belly whacker. And when we weren’t at the pool we were generally down at the river swimming or fishing. In the years when our friends the Browns came as well, Uncle Arthur would grab me by the two at some ungodly hour of the morning around dawn so that his sone Garaham and I could go fishing. 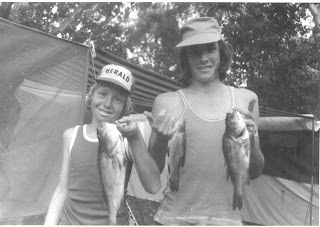 In the early years we would generally come back with a feed of redfin that we’d cook up fresh for breakfast. As I got a little bit older I’d play golf. I could be a student member with reciprocal rights to a lot of Melbourne Golf Courses for $5 per year which was a bargain even if I only played occasionally during the year. I never played often enough to become any good at the game and I’m just as happy walking around a course these days and taking photos rather than trying to bash one of those little white balls. My sister Karen and Shirley Brown were far more sociable than I was and they made plenty of friends up there over the years, much to Mum’s chagrin because she didn’t like them mixing with boys. In fact every night she’d lace up their side of the tent so that they couldn’t get out. In those days though, tents didn’t have floors so they simply waited a while then lifted the side and snuck out. I remember one night Mum came and got me from the Van because she’d found them missing and I had to march around the park with here whilst she called out to them. We eventually found them across the other side sitting down laughing with a group of young blokes. Yes, Mum was over protective. One year it absolutely poured with rain the whole time we were there. Dad must have had to return to work early because I remember Mum had to dismantle the camp, pack up the van and drive us home. The van boiled every 50 mile and we’d have to stop and refill the radiator. It took us around 12 hours to get home that year. I’ve written before about how Karen and I used to have a race to see who could get brownest the quickest. Sunburn wasn’t the horror story in those days that it is now. We didn’t cover up, in fact we wore as little as possible and lay out in the sun for hours at a time. In Dad’s words by the end of the holidays we were all as brown as berries. As I tend to do on holidays, a lot of time was spent reading. I remember that I bought the Robert E Howard Conan books one year at a book store up there which were my first introduction into the Sword and Scorcery genre. I re-read the Lord of the Rings and the Dune trilogy one holiday and became a fan of Michael Moorcock in yet another year. And I shouldn’t forget the E E Doc Smith Lensman series. Fo the most part they were good times. I’m sure Mum and Dad chose Corowa because it was in New South Wales and therefore had poker machines in the local clubs. But Dad continued to drink while we were away and the rows would also go on. Often Mum would march over to the bowling club after Dad had disappeared for too many hours. She wasn’t averse to yelling and telling him what she thought in front of everyone figuring that embarassing him was the only way to get him to leave. And she was right. I think that was where I grew to hate New Years Eve because inevitably everyone would get pissed and so I’d hide in the van reading my books, venturing out when the clock struck midnight and quickly retiring after a fast Happy New Year to everyone. What I liked best was that we were away from home, for a while the world was on hold. No school work, no need to mow the lawns or polish the shoes. I could do what I wanted to do when I wanted to do it. read, fish, play golf, swim, all the things that made summers fun and school seem a long way off. 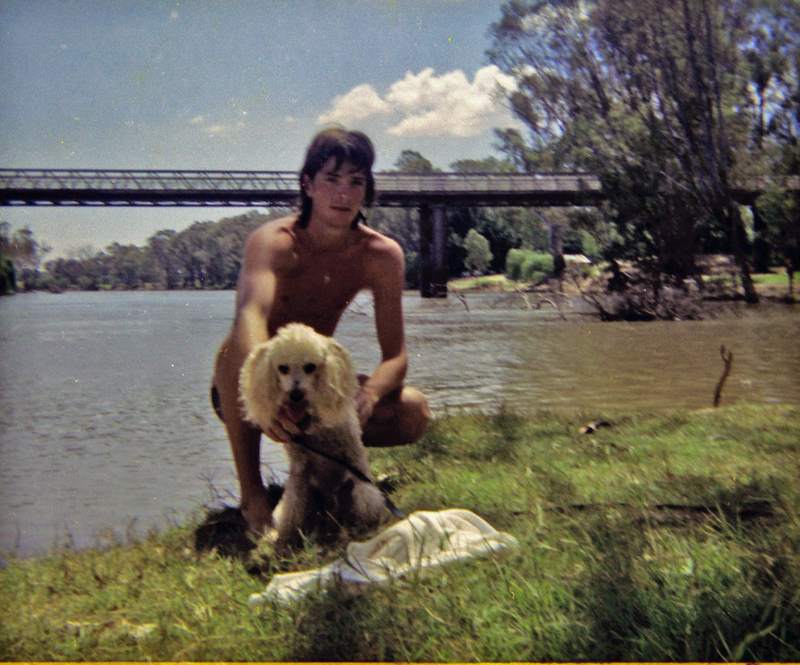 The year I went to univeristy was the year I stopped going to Corowa. Holidays with mates were more important than holidays with Mum and Dad, and anyway, I had to work over the school holidays to earn enough money to see me through the next year. Thus ended 10 years of summer school holidays with good memories far outweighing the bad. I’ve been back home from the south coast of New South Wales for a couple of weeks now and haven’t found the time to blog much. Lots to say and so little time. However, I thought I’d mention this observation and ask whether it is the same in other parts of the world. On our last nigh of holiday we decided to have fish and chips for dinner. Now in a seaside town during the high holiday season that usually means waiting up to an hour for the food after ordering. Generally it’s worth the wait and I usually take a book to read while I’m waiting anyway. On this night as i drove down the main street a volvo driver decided to stop in the middle of the road in front of me, no indicator, no spare car space for him to wait for, he just decided to prop. Being in holiday mode myself I probably showed a bit more patience than usual and waited behind him, figuring that sooner or later he would decide what he wanted to do. But he didn’t. And as I sat and watched as a couple of minutes rushed by I saw around 20 other people enter the fish and chip shop ahead of me. Already resigned to a long wait I knew it would be longer because that Volvo driver was totally oblivious to everyone else around him. Then on the way home the next day I found myself passing another Volvo driver around a dozen times. He would slow down on the sections of the Princes Highway that had double lines or many curves where there was no opportunity to pass and then when an overtaking lane appeared he would move from 20 kph below the speed limit to 10 above it. What do these people think? Is it a deliberate ploy to make the rest of the non-Volvo world angry? Anyway I’d speed up enough to pass him, then slow back down to the speed limit only to find he would pass me again and wait until we hit the no passing areas before once again dropping to 20kph below the speed limit. So tell me – have you noticed the same type of behaviour from volvo drivers where you come from? Dad would always sing Happy Holidays in his best Bing Crosby voice as we’d pull out of the driveway on Boxing Day morning on the way to Corowa situated on the New South Wales side of the border on the Murray River. This was my life at Christmas time as a kid. We started holidaying at Corowa sometime around 1969 after we had visited there one Easter when we had camped at Myrtleford. We camped at Ball Park, right on the bridge over the river and pitched our tent on sloping ground for the most part. 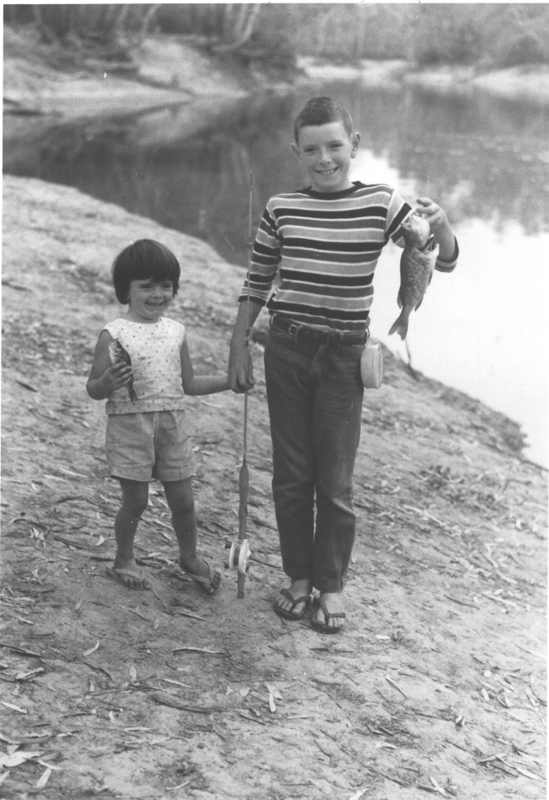 For us kids, it was a great place, we fished and swam the river, there was an Olympic sized pool adjacent to the camping ground and the golf course was about a 10 minute drive down the river. In most years, at least early on, the Brown’s came away as well. Dad and Uncle Arthur had grown up together and we regarded each other as family, spending a lot of time together, not just on holiday’s but on weekend barbecues and drives through the bush. Uncle Arthur used to enjoy grabbing me by the big toe and dragging me out of bed in the morning so we could head off along the riverbank fishing. In the early years we caught a lot of redfin and there was nothing better than coming back to camp and cooking them up for breakfast. But later on the European carp began to take over the river and the edible fish were few and far between. 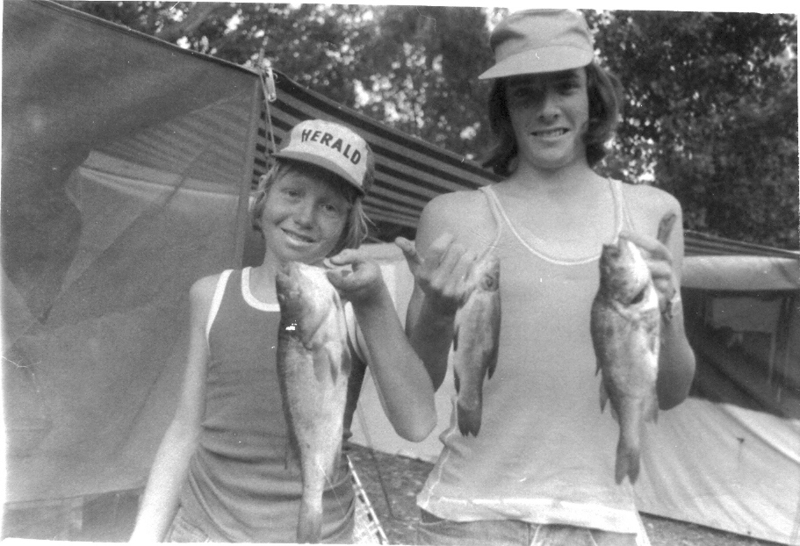 Of course that may also have been a reflection of my skill as an angler. 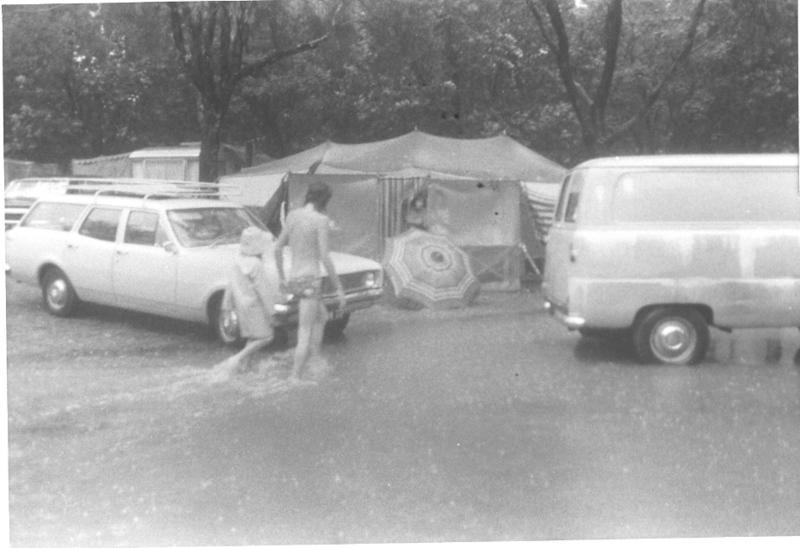 I was lucky enough not to have to sleep in the tent because I had the luxury of Dad’s old Ford Thames Van, complete with a three inch foam mattress and terylene curtains to keep the mozzies out. There was no possibility of speeding in the old thing because loaded up with everything we took away it was lucky to get over 45 mile an hour. 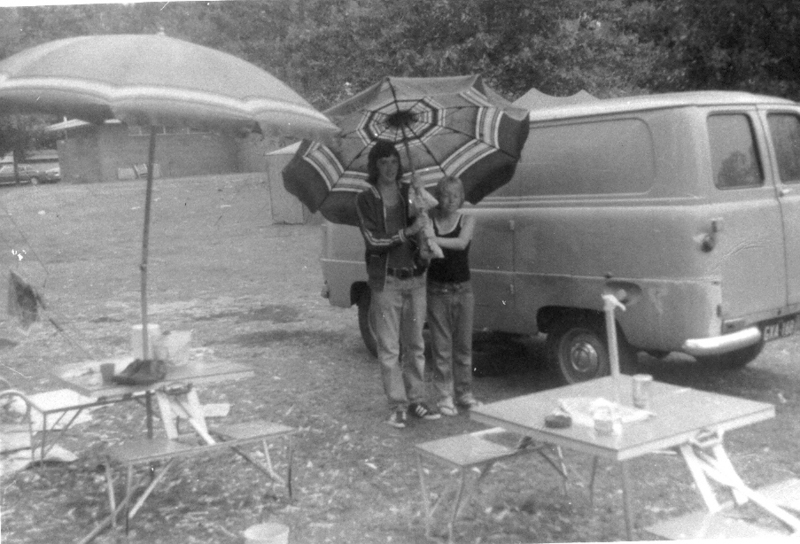 When the Brown’s stopped coming away with us and I can’t remember why they did, I was able to bring along one of my cousins or a mate and they’d sit in the back of the van on a deck chair with the camping gear piled high around them. The van went to God not long after this picture was taken but Dad then bought a Datsun Homer which was a distinct upgrade to the old Thames. I’m not really sure why Mum and Dad chose Corowa, except that they spent a lot of time playing the poker machines which at that time were illegal in Victoria. Dad would get drunk and Mum would sometimes go over to the Bowling Club, create a scene and virtually drag Dad back to camp. We kids of course weren’t allowed anywhere near the clubs except probably once a holiday when we’d go over for a meal. A lot of time was spent at the pool and we’d sometimes have a competition to see if we could swim the entire 50 yard length under water. Bombs and horsies were allowed, at least I think they were, I have no memories of any life guards wandering around telling us not to do those things. I do remember that one end was 12’6” deep and we’d play another game where we’d drop a rock on the bottom and have to duck dive down to grab it. These were days before we knew about holes in the ozone layer and we tanned by lying on our towels on the concrete paths smothered in coconut oil. When Karen got older and started to bring friends along and their interest in boys was developing, Mum used to lace up their side room on the tent to stop them going out. But tents didn have built in floors and it was easy for them to creep out underneath and go visiting other friends. I haven’t asked but I’m not sure Mum knew they were sneaking out or maybe she just turned a blind eye. 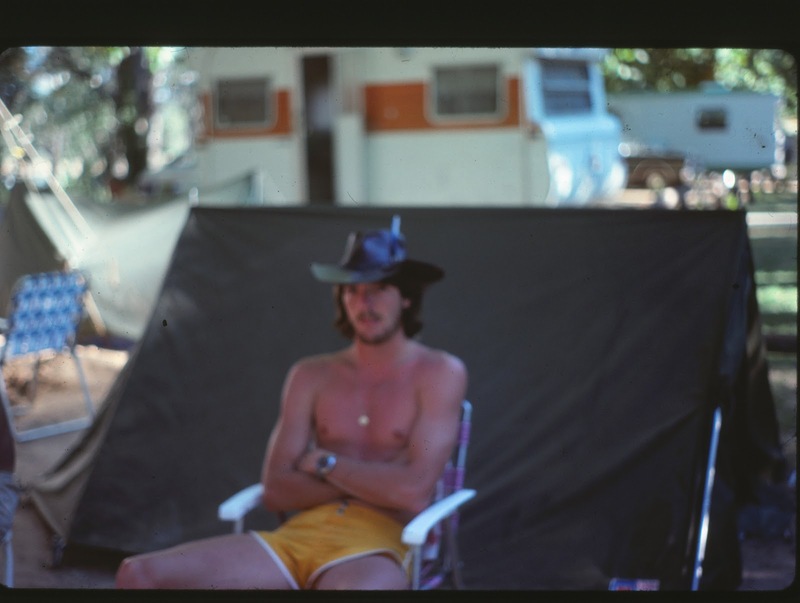 I think my aversions to New Years Eve began on those holidays because Dad would invite whatever stranger wanted to around for a beer, which usually became a dozen and often the night would end with blokes getting pissed on our campsite, in our space, with nowhere for me to hide. I expect that I spent a lot of time lying in the van on those nights reading by torchlight. For all that, they were fun times and I will treasure those memories of camping.